As I mentioned in my last post, I flew back to Washington State to spend some time with my family and watch my sister graduate from High School. She and I have always been close because of what we went through growing up, and I’m very proud of her and know she will go on to succeed in whatever she does. Ok, end sappy section. For now. My sister Bekah picked me up from the airport at 11:00 PM on Friday, June 2, and went through heck to do it, so we grabbed ice cream on the way back. It was the least I could do. 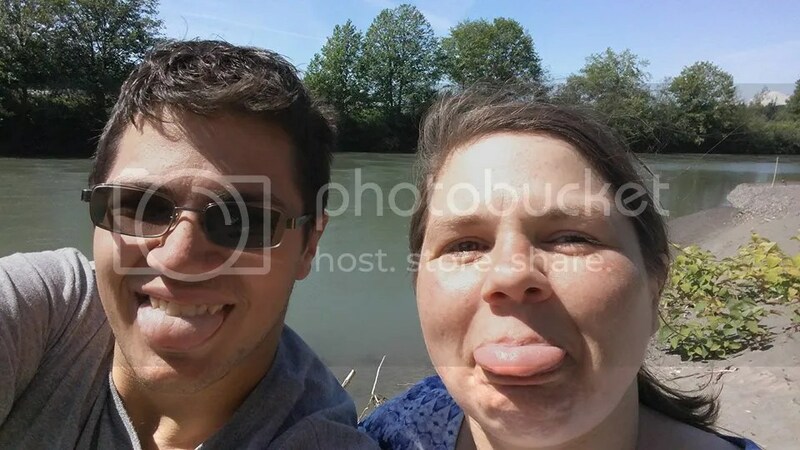 I had previously made plans to go out to Ellensburg, WA with my friend Emily (an alumni of Central Washington University) and my sister so I could fish and spend time with both of them, but Emily got too busy because of her job (teacher) and grad school, and had to cancel. Adjusting on the fly, I picked out a new location just over the Cascade Mountains (and one spot along the way). I was hoping to pick up some of the Western-exclusive species such as Largescale Sucker, Mountain Sucker, Northern Pikeminnow, and Bridgelip Sucker – this would give me a little bit of an edge over some of my competition (I’m looking at you, Tony!). After driving for 2 hours and another 15 down a winding dirt road, we arrived at our first spot. To my dismay, it did not look like I had imagined – there was very little slack water that was likely to hold suckers. It was still beautiful, though. 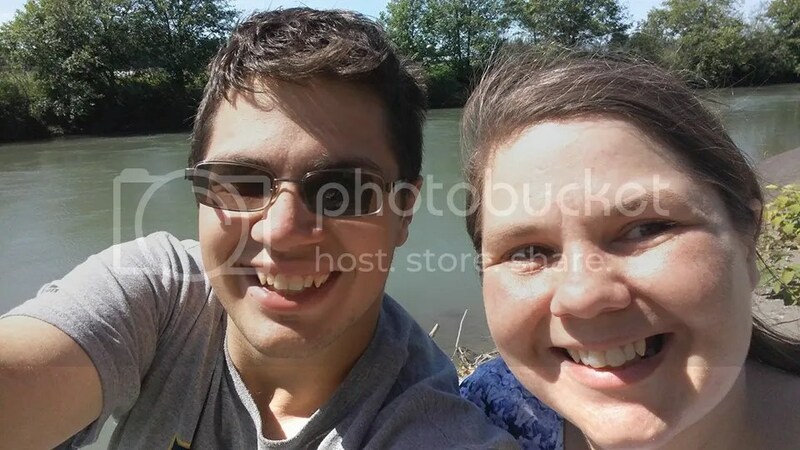 Bekah and I made the most of it and did some scouting (it involved getting stung by stinging nettles, almost falling into swampy-looking water, and much laughter), and ultimately settled on a mini-eddy on the side of the river. While we were setting up, my sister excitedly pointed out a fish that was moving around in the area. Houston, we have contact. Unfortunately, we could not tempt this fish, and we spent another 45 minutes or so soaking bait in the hopes that SOMETHING would grab it. 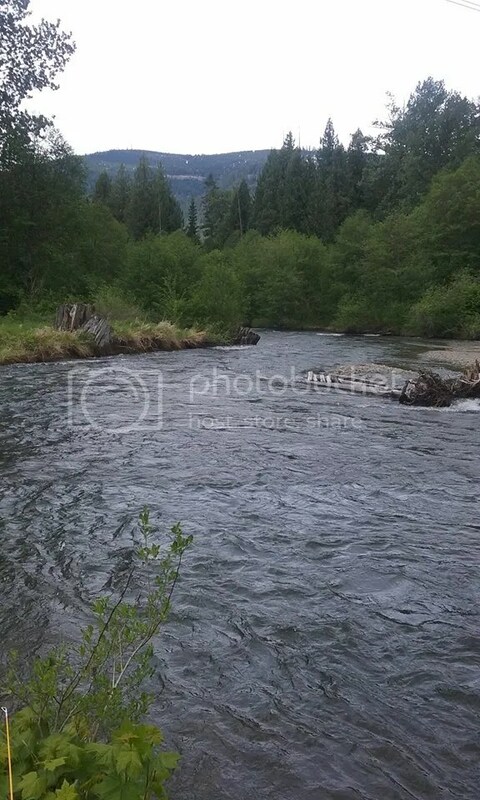 Suddenly, my sister pointed out that a group of vehicles had turned off of the dirt road on the other side of the river (probably 1000 feet from the river), and were headed towards it. She nervously suggested that we leave, and I agreed and started calmly packing up our gear. When I saw that the cars weren’t slowing down, I became less calm. Frantically, we packed up our supplies, and started walking away. When we turned back to see one of the vehicles (full of middle-aged men) plow into a shallow part of the river and drive across, we turned around and ran away. It was a strange experience – none of the men (between the group there were probably 8 of them) had shouted or made any kind of gesture, but because we were in the middle of nowhere, we weren’t taking any chances. I have no idea what would have happened if we had stayed, but I am glad that we did not. We drove to several more places, including two spots which ended up being complete busts (we were unable to access the river at either place), we finally settled at a stretch along a retirement community, and fished there for the rest of the afternoon until we had to leave so Bekah could make it to an end-of-year party for her Sailing team. Notably, I did spot another small fish in the shallows and attempted to sightfish for it, but was unable to tempt it. It didn’t look like a sucker – more like a bass, but I was puzzled by that because neither Smallmouth nor Largemouth bass would have been in a cold mountain river. No fish were caught, but I got a lot of good, quality time with my sister, which was the main goal anyways. When I got home, I mentioned my slight disappointment to my mother, and expressed a halfhearted desire to go fish near the Canadian border for a mythically rare sucker. 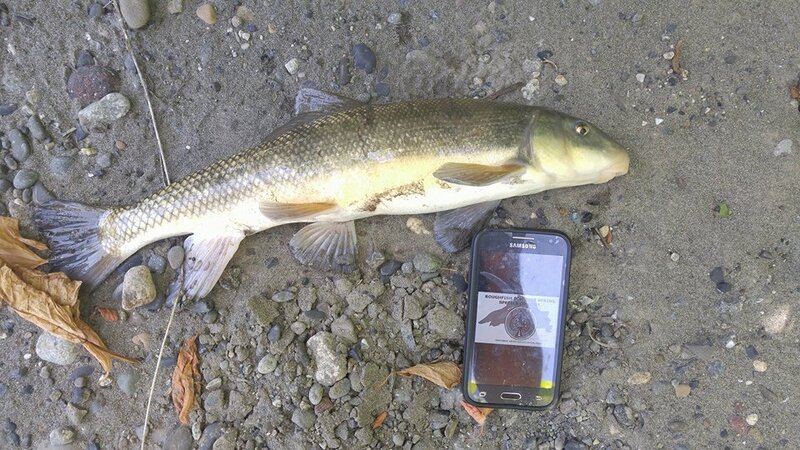 The Salish Sucker only exists in several creeks in the world, and one of them just happened to be within a 4-hour drive of my hometown. It would be a shame if I never attempted it. Surprisingly, my mother volunteered to go with me on Monday. I think she was glad to have an excuse to spend some quality time with me, and I’m glad she volunteered. Monday rolled around and we were up bright and early (8:00 is way too early when I’m taking Paid Time Off, ok?) and embarked on our journey North to Bellingham. When we arrived at my first spot, it was very dried up and on private property. Not to be deterred, I suggested that we try back along the road a little further, but the ‘road’ that led to the creek was really a tiny path through a cornfield. 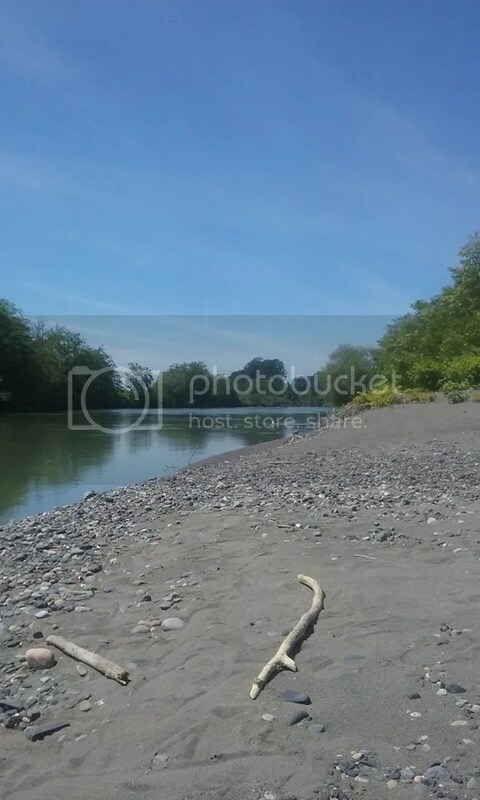 Thankfully, we were next to the Nooksack River, and there was a turnout along the way. We checked the turnout, and I couldn’t figure out how to get down to the water, so I scouted upstream a little ways. When I got back to the turnout, a local man was there, and I asked him if he knew where I could access the river. He pointed me downstream and explained that there was a walking trail to an easement that was open to the public. He described it as a sand/gravel bar that spanned the bend of the river and was often fished by locals. As he was describing it, all of my ‘local knowledge is key’ alarm bells were ringing, and I knew I had to fish that bend. We talked a bit more about fishing in the area. I learned that the creek I had travelled so far to fish actually runs through the main town, and made plans to fish it later. For now, though, I needed to fish. I’d been cooped up in a car for 3.5-4 hours, sometimes driving out delicious-looking water, and I was going to fish darnit. My mother and I gathered our things from the car, and began walking back. When I approached the water, though, I realized that it was crystal clear and very shallow. Additionally, the current was moving quickly through the part of the bend we had set up on. No matter – we’d give it a shot, and maybe I’d scout the rest of the sandbar for some better water. I got my rod rigged up and reached for the worms. They weren’t there. My mother had left them in the car. Trying (unsuccessfully) to hide my disappointment and impatience, I got her key from her and stalked purposefully back to the car. It definitely didn’t take me 10 minutes each way. When I got back, I baited and tossed out, then went to scout the rest of the bend. Generally speaking, the back end of the bend is slower and deeper – we had originally set up on the top/front side of it. Sure enough, the back-bend was absolutely delicious-looking. Not only did the bank steeply drop off into a nice slack area, but the substrate changed from gravel to sand. I informed my mother that I had found a much better spot – the kind of spot that sucker fishermen dream about – and we moved. And then it was the waiting game. We relaxed in the sun, and I learned just how hot sand gets (I do not recommend bare feet in this situation – I thought I was going to blister!). It as only a matter of time before my rod bent….there it is! I almost immediately identified my fish as a Largescale Sucker once I hooked it – it fought like a White Sucker, and when its back broke the surface, I knew for sure. When I landed it, I yelled at the top of my lungs (well, almost) because there was nobody else around and I jumped up and down. This was the first new species of the contest for me, and one that I’ve wanted for a long time. They’re not very difficult to catch or find, but I grew up a long way from rivers, so it took me a lot of effort to catch one. Since my mom was with me, I even got to pose with it. Excited, I released it and immediately re-cast. I knew there were Longnose Suckers in this river as well, and I had the offchance at Pikeminnow and Cutthroat Trout. I kept getting pecked at by something mysterious, but had left my small hooks back at the car. Eventually, I managed to hook and land a tiny Rainbow Trout (the picture has been lost, but it’s ok because of what happened later). After a while, we decided to pack it in and go fish for Salish Sucker in the creek. It took us a lot of driving around, but we finally found the place the local man had mentioned. When we got there, a young boy was leaving. He noticed that I was rigging up my rods and asked if we were targeting trout – I said no. 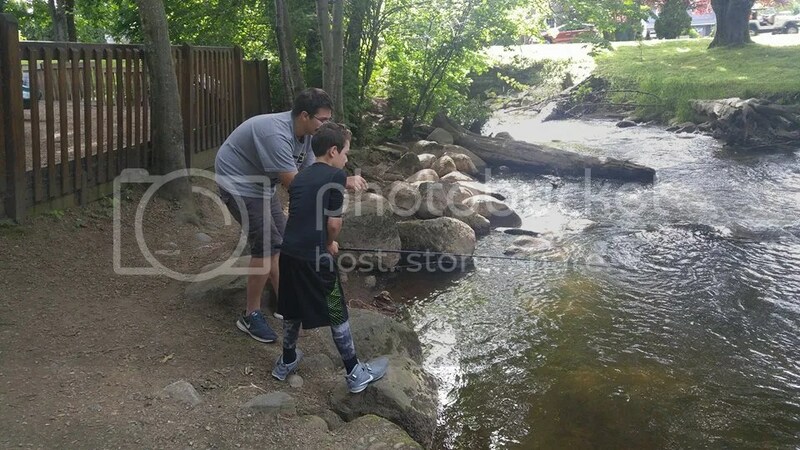 I knew that this creek was stocked with trout for local kids (and, indeed, I would be breaking the regulation by fishing it at my age), but that’s not what I was there for!!! It turns out that I had not brought light enough line to fit through my small hooks’ eyes (you need 6# test or lighter), and the boy recommended a local sporting goods shop up the street and said they would probably give it to me for free if I just wanted a little bit. We followed his instructions, and when i got there, he was already there and browsing the fishing aisles. 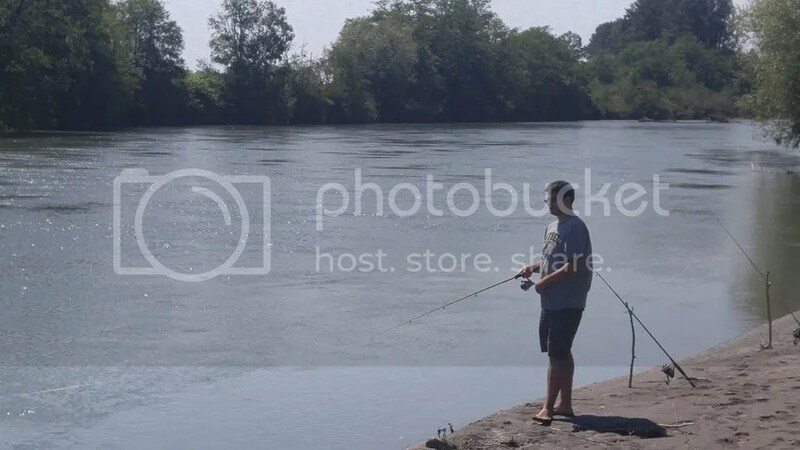 He helped me get my lighter line (he did the hard work of asking – I just talked to a local woman about the Largescale Suckers she had caught earlier in the day), and I was geared up and ready to fish. 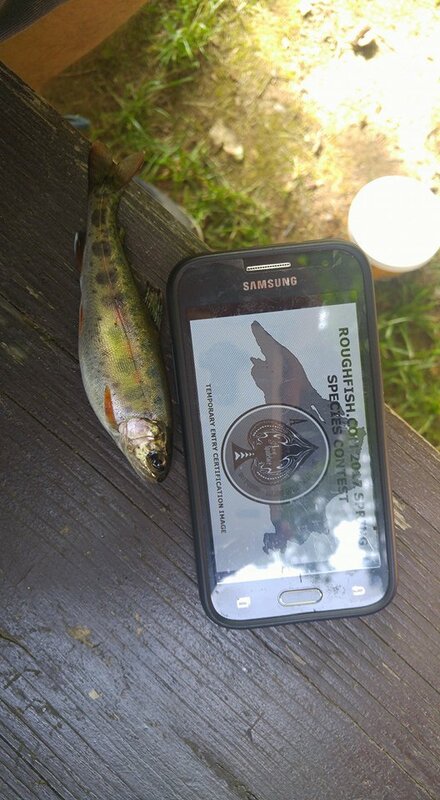 Almost immediately on my first cast, I hooked and landed another mini-Rainbow Trout. I decided to use this as my contest entry. 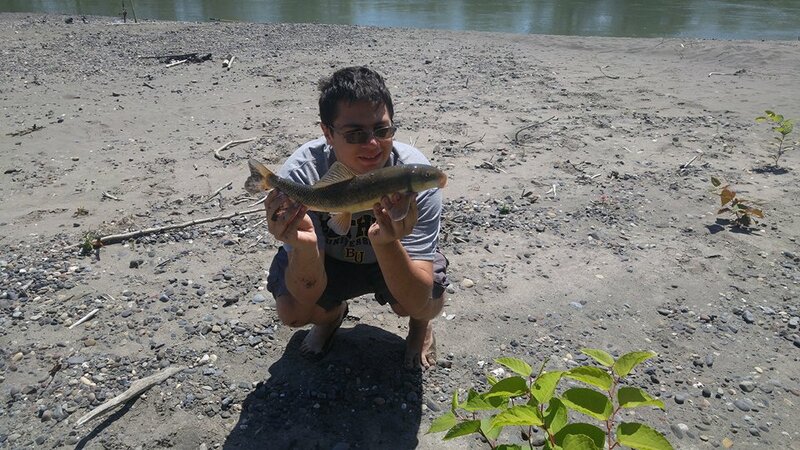 This was actually the biggest one that I caught – I had a hard time keeping the baby rainbows off of my line. I caught one that couldn’t have been much larger than my pinky finger, if that. I fished up and down the stream – in runs, in pools, and around cover. I was met with baby ‘bows at every step. At some point, a local boy (not the same one as before) came up and started asking 9,000,000 questions about what I was doing. Seeing as I wasn’t really catching my sucker anyways, I helped him catch some trout using my rod. It was a big bulky rod, not meant for 4″ fish, but I don’t think he cared very much. We eventually gave up and left to go home. I caught one new species, and another species which is significantly more difficult to catch in MN, and got to spend a day sharing one of my passions with my mother. It was a good day. I returned to Minnesota on Sunday, June 11, with 5 species to my name and a lot of catching up to do.